*Disclaimer: I received an e-copy of this book from Lola's Blog Tours in exchange for an honest review. This does not influence my rating or the content of my review in any way. What a read! 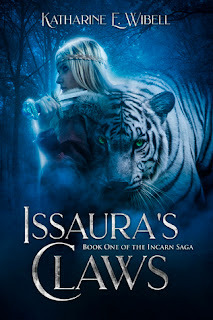 Issaura's Claws was a book that surprised me in a lot of ways. It also reminded me for a little while of Mulan, which made me even more curious about the story. Issaura's Claws is the story about Theriomorphs, a race of humans that can shift into an animal, and one special Theriomorph girl, Lluava. I loved the way the author explored shifters in this book. It definitely was a new set of rules that I haven't seen before. Basically each Theriomorph has his or her own animal, and no animal is discarded or thought of as weak. From the biggest to the smallest, they each have a role to play in the upcoming war, and they're each taught how to use the size of their animal to their advantage. I also liked the mythology around how Theriomorphs came to be, which is explained pretty early on in the book. The book opens up with Lluava and her younger sister at school, where they run into some trouble with a few of their human schoolmates. The readers find out very early on that humans hate Theriomorphs, a hate that is most likely fueled by fear of the unknown. Then the part that reminded me a little bit of Mulan came, where the king's soldiers come into the town where Lluava and her family lived and announce that a number of the people living there will be recruited in the army, because the war had started. With a mother that had to take care of her two younger siblings, and a grandfather that was too old and sick to go to war, Lluava is the only one that could go to war and possibly come out alive at the end of it, so she enlists. Lluava is definitely an interesting character to read about. She's willing to push herself and she wants to be treated the same way males are being treated. She can't accept the fact that female recruits are trained to be simple nurses, while male recruits are trained in the art of combat, and the truth is I didn't understand that either. I found it interesting that the recruitment announcement was identical regardless of age or gender, but once they arrived at the camps they were separated by gender. I was very happy to see Lluava challenge that separation and I was proud when she was accepted into the male camp. There were times I didn't agree with what Lluava was doing, and I found her to be exaggerating a little bit in certain situations and acting a little bit too harshly in regards of her friends. But considering she is living in a stressful situation, I came to accept that about her. I can't really say which of the rest of the characters were my favorite, because I loved them all. I wish we could have had some parts of the story from their perspective, but Lluava's role in the war is pretty important so I understand why we get her POV in the telling of this story. The writing style for the first half of the book threw me a little bit, because it was a little bit too fast paced for what I thought the story was aiming for. Of course, once I realized that some of the details I was hoping to read more of weren't the real focus of the story, and once I got used to the writing style, I was able to enjoy the story a lot more. The pacing of the story also took some getting used to, because this book definitely moves faster than the second book in the series, but after I got used to it, I was able to enjoy the story a lot more. The second part of the book, once the war breaks out, is pretty graphic and pretty heartbreaking. The author didn't favor anyone in terms of who gets to live and who dies, and while that part broke my heart into million pieces, it was also the part I loved about the story. I also wasn't expecting the bad guy to be who it turned out to be. I had my eye on someone else, but looking back at it, it makes complete sense. I've said this in my review of the second book (which you can check here if you want), but I can't wait to see where the next installment takes our heroes. I'm expecting more heartbreak and I can't wait. This is definitely a series to check out!